The first two nights of FashioNXT have been entertaining to say the least. Right away, the inauguration of the event by Mayor Charlie Hales seemed to throw some subtle shade at Portland Fashion Week by very steadfastly declaring that precisely October 8-11 (the exact dates of FashioNXT) is the one true fashion week in Portland. Next up, opening night consisted of four designers in from China in a coordinated event to try and strengthen our relationship with Shenzhen a fashion capital. Our fashion community could learn a thing or two from these concise, thoughtful, cohesive collections. From the gorgeous silk and tweed combos of Ngan Lok to Lu Yu’s use of print (and Song Hong’s cashmere cavalcade in beige), the evening was a stylish treat. 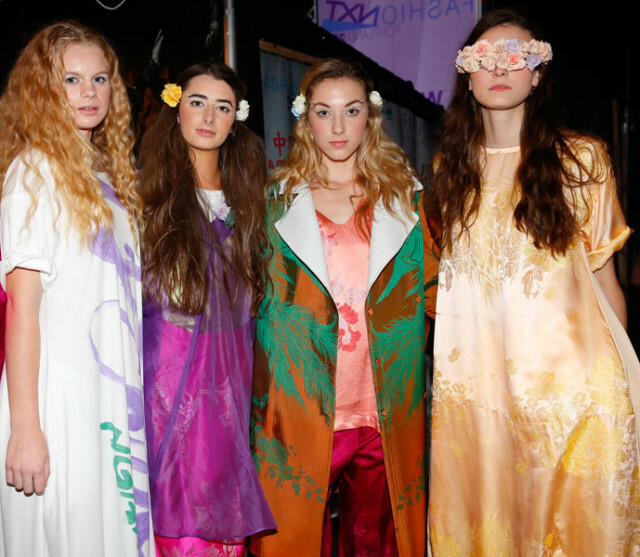 First showcased the return of last year’s winner Amy Sim, now moving to sweet bridal wear. Stephanie Dong in a mix of bridal and evening wear with some lovely designs that had some fit issues on the models. New designer Atiz from Seattle (formally an inorganic chemist) has an impressive knowledge of textiles, but a line with little cohesion as the colors, silhouettes, and fabrics all felt as if they were guests at a different party. Sonia Kasparian (known to many as Urchin Redesign) officially launched her new line of red carpet and evening wear with the some stunning, intricate gowns made with an obvious deft hand. Finally, the time came for Emerging Designers with showings from Cindy Koon’s neutral minimalist collection thought out head to toe in styling and Wendy Ohlendorf’s offering that was high on concept, but needed work on construction. In the end, as a judge I felt the most sellable and intriguing pieces came from Myriam Marcela. Born and raised in Mexico, the Portlander used her love of color and attention to detail to produce a feminine, gorgeous, mix-and-match collection. Tonight’s shows include Seth Aaron and Michelle Lesniak, while tomorrow comes the red carpet glamour of Michael Costello. Tickets are on sale here.